The Premium Solid Lean Muscle Builder. If you’re into building solid lean muscle without adding fat, then you are on the right track! 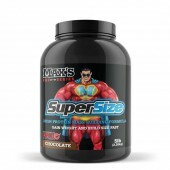 Max’s Whey Isolates is the solution! Nature's No. 1 muscle building protein. Available online at Rock Hard Supplements or you can grab it in our store. Whey Isolates is a premium Whey Formula that combines Pure Whey Protein Isolate with fast absorbing Hydrolysed Whey Peptides to give you the Ultimate Whey Protein for building lean muscle. Each 30g serve of Whey Isolates contains 23 grams of pure whey protein and is very low in fat and lactose. It contains naturally high levels of BCAA’s to stimulate more muscle and is a rich source of L-Glutamine to boost recovery after hard training. Whey Protein Isolate (WPI) is nature’s most bio-available protein for building muscle and works synergistically with Hydrolysed Whey Peptides. WPI is not one single protein but a collection of protein ‘fractions’, each with specific benefits. WPI is also a rich source of Branched Chain Amino Acids, especially L-Leucine, that are key regulators of protein synthesis and muscle-building. Hydrolysed Whey Peptides is pure Whey Protein Isolate that has been enzymatically broken down to small peptides and amino acids so it requires virtually no digestion and can be absorbed immediately. 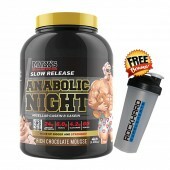 It is ideal for taking immediately after training for rapid recovery or when fast protein uptake is a priority. Vitamin & Minerals – Whey Isolates includes a full spectrum of essential vitamins and minerals to support your body’s metabolism to ensure maximum results. Take 2 serves per day between regular meals – one of these should be post training. Mix 30 grams (approx. 1 scoop) in a shaker with 200ml of low-fat milk or cold water, and shake for 30 seconds or until powder is fully dispersed. Consume within 30 minutes. 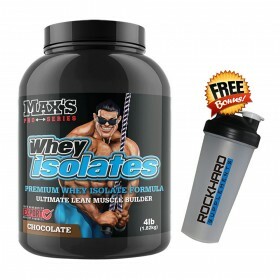 MAX’S Whey Isolates is recommended for trainers looking to speed up their recovery and increase lean muscle. It is ideal for someone looking to maintain a low level of body fat while building muscle. Hydrolysed Whey PeptidesA fast active pure Whey Protein that has been enzymatically broken down so it requires no digestion. It is ideal for taking immediately after training for rapid recovery or when fast protein uptake is a priority. Whey Protein Isolate is the most bio-available and best protein for building muscle and works synergistically with Hydrolysed Whey Peptides. It contains high levels of Branched Chain Amino Acids, including L-Leucine, which are key regulators of muscle.